It's April 1st and -- no fooling -- we are going to spend an entire month of blogs celebrating poetry! National Poetry Month was established in 1996 by The Academy of American Poets. The Academy was founded in 1934 with the dual missions of "supporting American poets at all stages of their careers and fostering the appreciation of contemporary poetry." In addition to sponsoring National Poetry Month, the Academy operates a website which features lesson plans for educators and an audio archive of poetry readings and lectures, as well as publishing American Poet, a biennial journal. Of course, we reserve the right to interrupt our month of poetry blogs with other items of current interest, but we hope that our focus on poetry will prove an interesting sojourn for both our readers and our writers and add a bit of variety to our roll of more than 540 posts to date. Today we want to mention a terrific supporter of poetry, Caroline Kennedy, whose love of poetry came from her mother, Jacqueline. 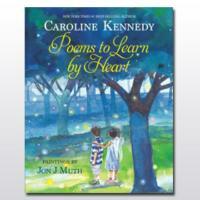 Caroline has compiled several poetry collections, including The Best Loved Poems of Jacqueline Kennedy Onassis and the just-published Poems to Learn by Heart, aimed at younger readers. There is a terrific interview of Kennedy by Associated Press reporter Jocelyn Noveck appearing in a number of places, including NPR.